The second day of July, 1776, will be the most memorable epoch in the history of America. I am apt to believe that it will be celebrated by succeeding generations as the great anniversary festival. It ought to be solemnized with pomp and parade, with shows, games, sports, guns, bells, bonfires, and illuminations, from one end of this continent to the other, from this time forward forever more. While he was off by only 2 days, Adams was spot-on in the part about guns! Safety should be everyone's first concern. After sundown, when celebrating the Fourth, be sure you are at least 500 feet away from an exploding Canadian National Railroad train. No one wants to sustain a life-threatening injury during the holiday. If you plan to be close to the fireworks, don't forget to bring ear plugs. You can sustain permanent hearing loss from the blasts of an exploding CN train. Who doesn't love a parade? If you are marching in a July Fourth parade (or just a spectator) and a slow moving CN train is crossing your route, do not try to outrun the locomotive. That locomotive will win every time. The sun is at its peak in early July. Be sure to apply plenty of sunscreen while you are waiting at a railroad crossing. You don't want to burn up while waiting for that slow moving CN train to lumber across. Alcohol and holiday celebrations do not mix. Never throw empties at a lumbering CN train. One could explode. Fireworks are illegal in Illinois and easily misused. 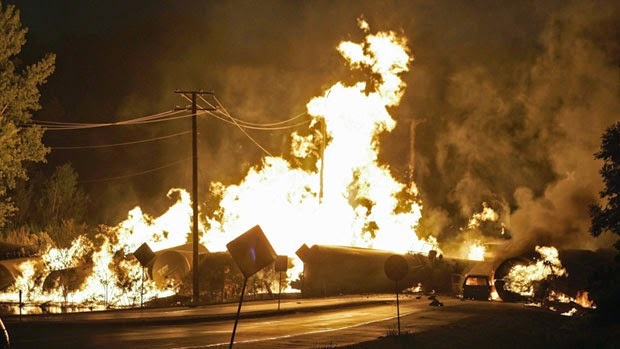 If you see an exploding CN train explode, do not refrain from notifying the proper authorities. Follow these commonsense safety tips and everyone will enjoy many safe and festive Fourth of July holidays to come. Historical note: Had the Founding Fathers won the War of 1812, Canada today would be the 51st state. Just sayin!